It has become somewhat of a trend for modern-day Nintendo to attempt to fix what isn’t broken; and in some cases, actually breaking it in the process. 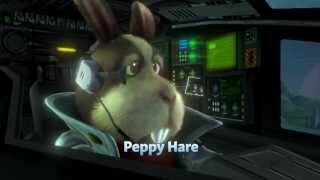 Such is the case with Star Fox Zero, the latest entry in Nintendo’s quirky animal themed Sci-fi space shooter for the Wii U. My time with the game felt more like a chore than a fun and joyous experience, as I wrestled with some awkward and confusing controls, which threw curve balls at me with a new mechanic just when I was getting close to wrapping my head around the current one. In short, the game just didn’t feel like a true Star Fox game, and the strange controls and gimmicky elements throughout are mostly to blame. There were some thrilling moments to be had, ironically when the game dialed back its crazy new elements and stuck to basic arcade-style shooting that Star Fox is known for. Yet, more often than not, the game inspired little, aside from a yearning to drop my gamepad and return to Star Fox 64, from which the game takes at least some inspiration, or better yet, the original SNES classic. It’s usually not a good sign for a sequel when it merely makes you hunger for its predecessors, particularly when the original iteration is over two decades old. On the surface at least, Star Fox Zero seems to be a faithful sequel and a worthwhile nostalgic trip that harkens back to the original Star Fox games on SNES and N64. Fans of the series will recognize our hero, Fox McCloud; Nintendo’s fury, animalistic version of Luke Skywalker, and his familiar colorful band of critter sidekicks flying alongside him. These still charming characters provide some admittedly amusing dialogue and surprisingly decent voice acting, though, they perhaps overdo the frequency of the voiceover at times. The story, like the characters, will also be familiar to the old school crowd. An evil empire, led by the mad scientist, Andross, has waged war and threatened to take over the Lylat system, and it is your job to defend your home planet of Corneria and restore peace to the galaxy. Pretty standard stuff, but it isn’t like the classic titles of the SNES and N64 needed an epic narrative to be great; and besides, the simplistic backstory is the least of the game’s troubles. As you’ve probably gathered already, it is the control scheme which takes center stage when it comes to its Star Fox Zero’s flaws. Now in theory, you would think motion controls for a space shooter would go together like peanut butter and jelly. So I suppose it is no surprise that Nintendo, a company that has helped pioneer motion controls, while shoehorning them in just about every recent title they create sans Super Smash Brothers, would opt for such a method. And yes, there were moments, at least during the more basic linear missions, where the tilt-controls felt intuitive and even downright enjoyable to use as I blasted my enemies with precision. But these moments were outnumbered by instances of jarring confusion. As I fumbled through a convoluted control scheme, something felt off, besides just my reticle, which Nintendo thankfully provided the option to re-center, as I constantly found it wandering to the side as I got lost in the action. The level of complexity and steep learning curve just seems very unnecessary and clashes heavily with a simple, fast-paced action shooter like Star Fox. The main issue is the need to look back and forth between the gamepad and TV screen so frequently. The first person perspective is on the gamepad (which you use primarily for precision aiming), while the TV screen shows a third-person view of the Arwing and is more ideal to use when flying. And rest assured, you will need to do both, as trying to bypass one or the other for the duration of your mission either leads to flying around like a drunk, or spraying lasers around mindlessly like a sci-fi pilot version of Rambo. In addition to aiming, there’s also the basic ship movement via the joystick, the classic barrel roll, somersault, U-turn, and subtle tilting maneuvers that help you dodge enemy fire or whiz through narrow passes. You will often find yourself disoriented, as you camera view, direction of your ship, and reticle all seem to be out of sync with one another. On top of this, your Arwing can transform into a walking robot-esque machine, and the game sometimes throws you into another vehicle altogether, i.e. the Landmaster tank. Each of these vehicles comes with its own distinct abilities and confusing mechanics, which unfortunately often act as a central component of completing a mission. While these vehicles certainly help add some variety, they perhaps change up the gameplay too much, providing the feel of a different (often less enjoyable) game entirely. The Gyrowing was particularly a nuisance to control, as it moved slow and lazily, offering little to the game. Its “ace-in-the-hole” is the ability to deploy a Rob-the-Robot looking fellow that you are occasionally forced to use to drop “smart bombs”, or access small areas, where you must then hack computer systems to progress using the gamepad screen as his sight. This is where Nintendo’s near desperate attempt to try and sell the features of the gamepad to the gamer, at the expense of the gameplay itself, becomes as transparent as a window. The Direct-i ability is perhaps the greatest of embodiment of all of Zero’s greatest flaws - awkward controls, unnecessarily complex and bothersome mechanics, and an overall ill-fitting concept that clashes with and slows down the pace of what should be an intense, adrenaline-pumping space shooter. It just seemed like Nintendo was trying to do too much at once here; like they had a boardroom full of designers who all presented their own ideas of control schemes and game mechanics, with an array of vehicles and decided to just throw it all in. As a result, everything just feels disjointed and overwhelming to grow accustomed to. You may even find yourself still struggling to fully wrap your head around this array of mechanics upon finishing the short and uninspired campaign mode, as I have. It is ironic that when the game seems to dial back the newly implemented gimmicks, or the “ingenuity” if you’d prefer, it ends up providing the most fun. This is because the original Star Fox formula was so solid. 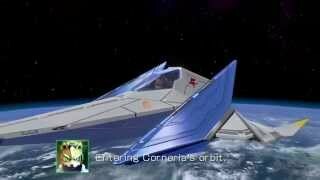 Besides the amusing subtle nods to past entries, including the original characters, voices, music, and aesthetics, the Zero does provide glimpses of that classic Star Fox gameplay as well, usually when your sole mission is to take out a horde of baddies as quickly and precisely as possible. These more straightforward portions not only allowed me to appreciate the motion controls a bit more, but provided some admittedly fun gameplay from time to time. The emphasis on enemy hits, medals, and badges, as well as the interesting (though perhaps a bit unrealized) feature of diverging paths, injects at least a bit of depth and replayability to the campaign mode. Some of the boss battles were also enjoyable and provided hints of familiar epicness from past entries, at least after getting over the frustration of readjusting my reticle in an attempt to follow the constantly shifting weak points of said bosses. 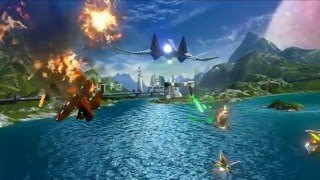 Star Fox Zero also has instances that allow for free roaming, but while this has its moments of mindless fun, it also brings the imprecise aiming controls to the forefront even more, making their flaws more apparent than ever as you try to scurry around and take out enemies from every which way, including behind you. Those looking for a neat sort of nostalgic easter egg can do so while utilizing the McCloud Amiibo, and after playing this game you’ll probably want to re-immerse yourself in the healing presence of the SNES classic in any way possible. Scanning in the Amiibo allows for a rather simplistic, but nonetheless amusing homage to the original SNES Star Fox. It swaps your flashy modern Arwing model for the traditional pseudo-3D sprites, and replaces the complex classical melodies with those memorable and charming 16 bit tunes from an age long past. It is a neat feature, particularly if you’re an old-school fan, but doesn’t offer much to the experience from a gameplay standpoint. Sadly, the only other way in which Zero truly emulates the original SNES hit is with the lack of any real multiplayer. Oh, there is a sort of co-op mode that allows two players to team up, controlling two aspects of the same ship. This is an interesting idea and makes the dual screen nature of the game more intuitive. It also gives a sort of arcade-style multiplayer vibe, as one person pilots the Arwing with a traditional controller, while the other focuses on the gamepad screen, taking on firing duties. Though, a true multiplayer mode, where a friend could be given the option to either engage in a battle royale with their opponent, or take to the reaches of space in a separate ship, would have made more sense and added more to the game. Aesthetically, Star Fox Zero isn’t anything groundbreaking either. Many of the environments are either uninspired or ring a bit too similar to stages in the previous entries. There is a common feeling of emptiness and underutilized potential throughout, and few notable points of interest within many of them. I would be lying if I said that I wasn’t impressed with the visuals, however, as they are overall slick and vibrant, providing some nice backdrops and pretty water effects in particular. The music is nothing to sneeze at either, as the soundtrack consists of some rich and epic classical-inspired melodies. It’s no John Williams, but still a nice way to flesh out and breathe a little bit of life and atmosphere to a game that could really use it. With the brief, largely uninteresting campaign, the funky control scheme, and odd additions and tweaks that clash with the style of the Star Fox formula, one begins to wonder why this game was even made at all. It just comes across as a means to show off motion controls rather than create an inspired sequel; motion controls that don’t function as they should anyway. It’s a shame, because a Star Fox sequel could have had so much potential, but this feels more like a weird spin-off that feels like a regression. The result is a game that provides only occasional moments of enjoyment - primarily when the game reverts back to its more traditional style, and litters it with strange gimmicky mechanics that force themselves upon you too often. It’s neat see familiar locations like Corneria in HD, and there are some other neat looking worlds, supplemented with rich melodies and spot-on voice acting. Still, many of the environments seem dull, empty, and uninspired. Convoluted controls that force you to constantly juggle the gamepad's 1st person perspective while also looking at the TV. This, along with a mostly sluggish and ineffective array of vehicles and weird gimmicks, further bog down what is already a mediocre space shooter. McCloud's entire crew makes a return, which would be neat if they didn't annoy so much with their constant yammering. Discovering multiple paths is one of the few notable additions, and, along with medal badges, provide a bit of replayability. The only co-op here involves two players controlling different aspects of the same ship, providing a novel feel at least for a short time, and making the dual screen concept seem a bit more sensible. Sadly missing is a true multiplayer co-op campaign, or any split-screen or online battle mode. The game ran smoothly overall, though load times were a bit lengthier than expected. "A convoluted experience with glimpses of fun"
Star Fox Zero is ranked #1367 out of 1434 total reviewed games. It is ranked #132 out of 138 games reviewed in 2016.